Graduate assistants at The University of Connecticut have voted to unionize — making them the school’s largest union, with 2,135 members. The governing board of the state’s flagship university unanimously voted in a “special meeting” last week to approve an agreement between the newly formed union — UConn GEU-UAW — and the university. These students work at least 20 hours a week and teach courses to undergraduate students. They are currently paid between $20,159 and $23,583 and can buy health insurance for $200 to $1,622 a year. A spokeswoman for the university said The UConn Board of Trustees and the administration stayed out of the students’ decision on unionizing. “The University has been, and will continue to be, neutral with regard to this effort. 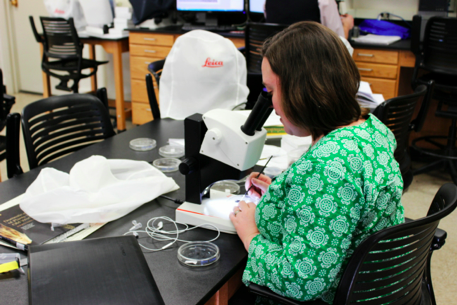 Individual graduate students are free to make their own decisions. The University and its senior administrators will not seek to influence the decision of any GA,” said Stephanie Reitz in a statement. Cera Fisher, a doctoral student in Ecology and Evolutionary Biology who works as a research and teaching assistant, praised the formation of the new union, announced Friday. “We took an exciting step forward today, which we believe will not only help us improve our conditions but will also contribute to making UConn a better institution,” she said in a press release. Numerous Democratic state lawmakers supported the creation of the union. Top lawmakers sent a letter to UConn President Susan Herbst outlining their support for the students to unionize. 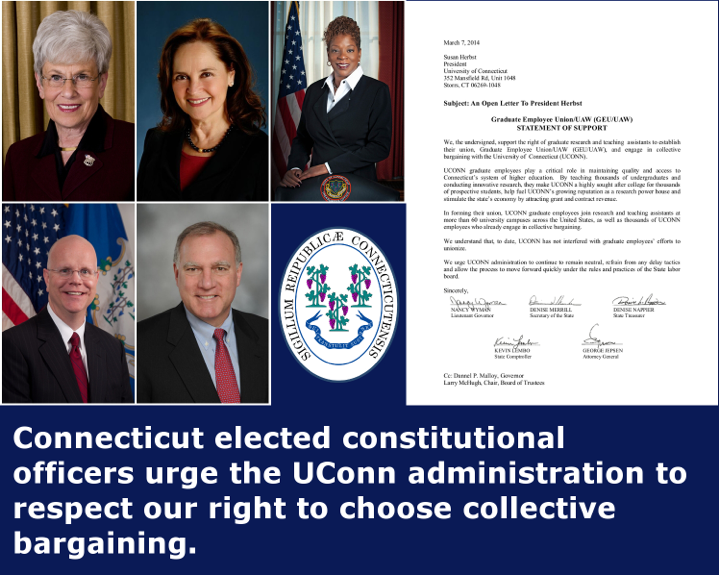 “UConn graduate employees play a critical role in maintaining quality and access to Connecticut’s system of higher education,” reads a letter addressed to UConn’s president, Susan Herbst, and signed by the state’s lieutenant governor, attorney general, comptroller, treasurer and secretary of the state last month. The state’s Congressional delegation also co-signed a letter to Herbst. “As you know, the duties of your graduate employees are integral to the operations of UConn,” the seven-member delegation, all Democrats, wrote Herbst in February. Seventy state legislators also signed a “statement of support”. The agreement does not need legislative approval because the employees will not be considered state employees.